Abby and Ian wanted Hawaii Wedding Invitations for their destination wedding in Maui. Here's the beautiful Passport Invitation I created for them which has a floral style customised in the colours from their wedding day. Abby and Ian also asked me to include some maps in their wedding invitations. 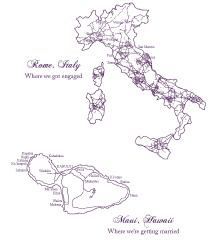 One of Rome, Italy as that's where they got engaged and one of Maui, Hawaii the place they have chosen for their destination wedding. 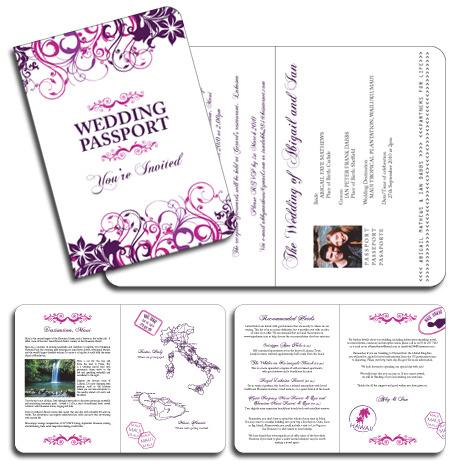 "We have really enjoyed working with Kate and would highly recommend her services to anyone who wants unique, personalised wedding stationery. She provided an excellent service throughout and responded to our many queries very promptly! We were so pleased when our invitations arrived. They were professional, accurate and customised to just how we wanted them. Since we have sent our invitations out to guests, we have received so many nice comments about their unique style and design. Of course I love creating invitations for weddings in any destination but it's always extra special to design ones for marriages in Maui as that's where my husband and I tied the knot in 2002. It's such a beautiful part of the world and will always hold a place in my heart. It's so easy to find beautiful photos of Hawaii to include in the design of any style of invitation. If you'd prefer an Airline Ticket or Postcard Invitation these can also be designed to be in keeping with your tropical destination. If you're looking something like this design for your Hawaii Wedding Invitations or stationery or if you're getting married in any destination please contact me with your ideas. I'm always happy to email over examples of designs I've created so you can see them in more detail and discuss what you have in mind for your own special day.